Description: BNSF Westbound Local Freight Train passing through Cosnino, Az. Description: It looks as if these two BNSF trains are racing up Cajon Pass. The warbonnet on the #1 main is eastbound and has just reached the summit. The locomotives on the #2 main are rear end helpers easing a train west down the mountain towards L.A. 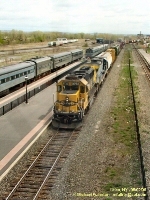 Description: BNSF 8733 heads up a westbound freight through the Utica, NY passenger station. Description: BNSF 8733 heads a westbound freight through Utica, NY. Description: Doing what they were meant to do, two EMDs pull a priority train! However, in just three short years lashups like this would just become a memory. Description: Not common power on the rack train today. 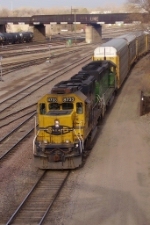 A GP60 has a ex BN SD40-2 in tow. Description: CSXT Southbound Phosphate Train K837 ( Chicago, Illinois to Mulberry, Fl. ) passing through 13th Street Interlocking in Birmingham, Al. Description: Empty fuel train U-HVRCHC. Description: Waiting to get into Argentine Yard were 2 ex-ATSF 4-Axles on BNSF Train L CHI0091 08 as a northbound heads for Santa Fe Jct., which was being occupied by 2 trains, one was headed by 2 KCT Geeps. Description: A couple hours later the GP60 trio return heading back west. I'm guess they went to Winslow. Description: This was parked in town when I arrived Saturday morning and finally left to do some work on Monday morning, it was ideling the entire time.